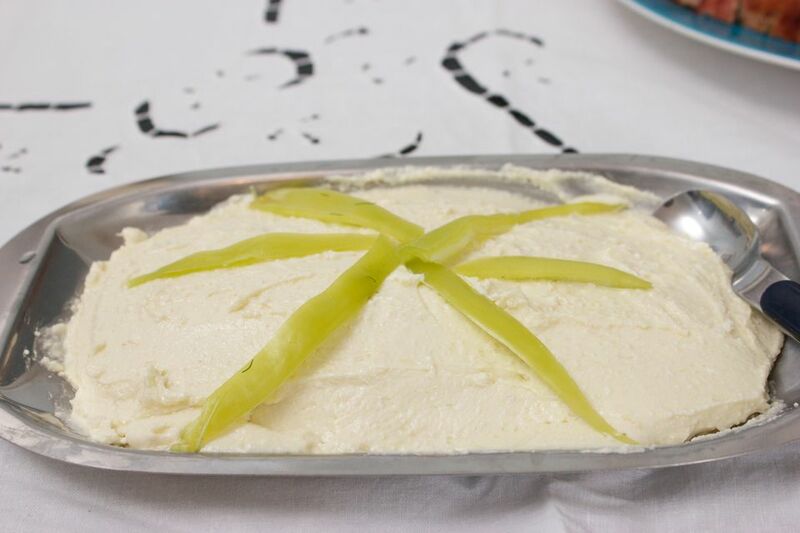 A specialty of the region of Thrace in northeastern Greece, this dip is served all over Greece - in varying degrees of heat. My family likes this one hot, so I use jalapeno peppers that make my eyes water just from touching them. This recipe works with red and green peppers. Mild or hot, this is a delicious dip. Crumble the feta into small pieces using a fork. Sauté the pepper in 2 tablespoons of olive oil until the skin is lightly browned. Remove the stem and discard, and chop the pepper into very small pieces. Using a mortar and pestle, add the pepper and the oil it was sautéed into the cheese and mash until smooth, adding additional olive oil if needed to bring it to the consistency of a thick (but not stiff) dip. Serve garnished with a bit of parsley. Alternatively: Put the cheese, pepper, and oil from sautéeing in the blender and mix, adding more olive oil if needed to bring to the correct consistency. Tip: If you have a pepper that's too hot, slit it open down one side under running water and remove and discard the white internal membrane. Pat the pepper dry before sautéeing.